Summertime offers wide open spaces and easily accessible fields to park beside. Please know that children are always welcome when accompanied by an adult. We love to see our future customers in action! *We accept Cash, Debit/Credit, or Farmers Market Nutritional Program (FMNP) checks as forms of payment. All transactions of $20 or less must be paid for in cash. Thank you. 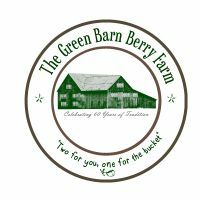 All content property of The Green Barn Berry Farm. 7299 Armstrong Road, Muncy, PA 17756.